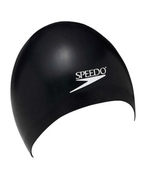 PRODUCT DETAILS: This lightweight and durable design holds its dome shape and rounded fit with no wrinkles, therefore, reducing drag. Made of silicone it can be stretched to over double its original size and allows head to breathe for a more comfortable fit. Import.